It’s already summer here in India and as always the problem of water scarcity lurks over our head more than ever before. Global warming and climate change contributes to the lack of adequate groundwater and forces many of us to depend on either water from borewells or the one supplied by the authorities. The water from both of the aforementioned sources might not be often the purest as it is and requires filtration to make it potable drinking water. This is where water purifiers play an important role. In this article, we bring you the best five water purifiers nominally prices under Rs.15,000 available in the Indian market for you to chose from. Without any further ado, let’s cut the chase and get started! Livpure is an Indian company which markets water and air purifiers in almost all states. The Livpure LIV PEP Pro Plus is one of the flagship water purifiers which offers an extensive range of filtration step to provide you with clean drinking water. The Livpure PEP Pro Plus has a minimal design which will suit any kind of home/office decor seamlessly. Apart from the three small LED indicators in the front, there is a water tap which can be used to fill bottles or glass with filtered drinking water. This water purifier has a wall mount hook at the back which helps it to be placed on a wall without the requirement of having a solid base to support the system. The whole purifier is built from food-grade ABS plastic materials which posses no threats to your health whatsoever. The Livpure LIV PEP Pro Plus has a 7L litre capacity storage tank and can filter water at a rate of 12L/hr. This small capacity water purifier is apt for a family of four during summers or small offices. The Livpure Pep Pro Plus comes with three stage water filtration mechanism including UV (Ultraviolet) + Reverse Osmosis (RO) + UF (Ultra Filtration) processes. The UV filtration is the most effective and eco-friendly method which kills and deactivates minute bacterias and viruses in the water by passing radiation through the water. The Reverse Osmosis process makes use of a physical filter which is capable of trapping dust and sediments up to 0.0001 microns in size. The Ultrafiltration process ensures that larger particles up to 0.01 microns get filtered before it reaches the RO filter. This three stage filtration mechanism helps the water purifier to deliver clean and safe drinking water. For reverse osmosis to work, an active electricity supply should be present so that the water is passed through the membrane at high pressure. The Livpure Pep Pro Plus water purifier comes with three status indicators which display the power ON/OFF status, purification process and the tank full status. Livpure offers one-year manufacturer warranty on this device. If any damages happen in between, the company provides on-site maintenance which saves you a great deal of time and effort. 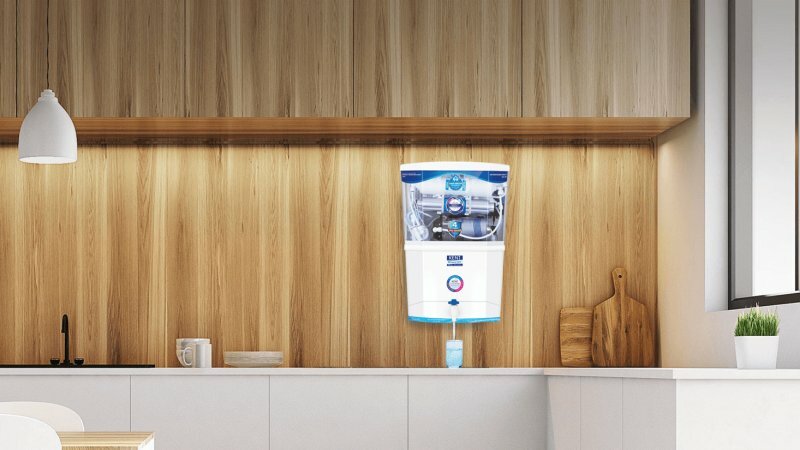 The Liv Pure Pep Pro Plus water purifier with its three stage filtration protection offers an affordable clean drinking water solution suitable for a small family or medium-sized offices. Eureka Forbes is an Indian company based in Mumbai which has been in the home appliance market dealing with products such as vacuum cleaners, water and air purifiers etc. The Aquaguard Shield from Eureka Forbes is a 6L water purifier loaded with features yet affordable by Indian standards. The Aquaguard Shield water purifier from Eureka Forbes has an industrial design which looks bold and beautiful at the same time. It can be installed in wide range of places such as hotels, restrooms, houses etc and will seamlessly integrate with the interior decor. The food-grade ABS plastic build quality is excellent and the overall purifier feels strong and durable. The front part of this purifier comes with LED status indicators which will provide a great deal of information in a single glance. This water purifier is not wall mounted and comes with four rubber paddings to keep the device firmly in place on a flat surface without slipping. The Aquaguard Shield has a storage tank capacity of 6L which is apt if you’re planning to purchase this device for office or other establishments such as hotels and shops. This water purifier can purify up to 6000L at once before the need for changing the filters arises. The water filtration capacity is about 20L/hr which is one of the fastest in the market available right now. It makes this water purifier the most suitable candidate for installation in places where there a considerable people movement. The Eureka Forbes Aquaguard Shield comes with a four-step filtration mechanism involving UV treatment, Reverse Osmosis and additionally the membrane protector technology and excess dissolved salts reduction. UV treatment and RO are two of the most common treatment techniques employed in water purifiers as you might know. Ultraviolet rays kill and disinfect the viruses and bacteria whereas in the RO process, solid particles are filtered out. The unique membrane protector technology from Eureka Forbes prevent scaling on the membrane surface due to particle deposition and allows efficient filtration process to continue. The excess dissolved salt reduction allows the water to have its natural taste and doesn’t make it bland. The Aquaguard Shield comes with a wide range of processor indicators which greatly enhances the usability of this device. There is tank full indicator which urges you to turn of the purifier to save electricity, purification process indicator, a low-pressure indicator denoting the unavailability of electricity to carry RO process and a no water supply indicator. Eureka Forbes provides a one-year warranty with this water purifier. The company has its service centres all across India and the availability of a service technician is always guaranteed near your location. The Eureka Forbes Aquaguard Shield offer excellent value for money deal for a budget of just under Rs.10,000. This water purifier is the one to purchase if you plan to use it in a high-density population establishment such as hotels and shops. Kent is an Indian healthcare products company based in Uttar Pradesh. The company has been popular among the masses for a short while now, thanks to the advertisements done by roping in people like actress Hema Malini. The Kent ACE is a premium water purifier priced under Rs.15,000 which ensures to retain the nutrients in the water as it is so that you can have a soothing natural water taste even after filtration. The Kent ACE water purifier is made of high-quality food grade plastics which is certified to be non-toxic. The design of the purifier is unique with interesting graphics labels in the front and a steel coloured trim which adds to the aesthetic appeal. The LED indicator strip is placed conveniently of the right side of the front bezel along with a water faucet which can be easily opened and closes with a single hand. The Kent ACE water purifier comes with a 7L capacity storage tank and features 15L/hr filtration capacity. This water purifier has a two-stage purification process ensuring all the sediments are removed and the viruses bacterias are disinfected before the water reaches the storage tank. UV treatment kills all the viruses and after the same, water is passed through a membrane as a part of ultrafiltration after which reverse osmosis is carried out as the last step of filtration. The patented Kent mineral RO technology makes sure that the essential minerals in the water are preserved to keep it taste healthier and soothing. The Kent RO has a computer controlled system which notifies the user when its time to replace the filter and the UV lamp. The beeping alarm along with the LED notification lamp makes sure that you don’t miss the alert accidentally. This device also features auto shut-off and on which significantly reduces the need for manual intervention. Kent offers a generous one year warranty on this water purifier along with a three-year free service offer which we think is a steal under the budget of Rs. 15,000. Pureit Advanced is a budget water purifier from Hindustan Unilever, which is a consumer goods company based in Mumbai, India. This compact water purifier may seem to look like a feature trimmed version of expensive purifiers but in reality, it does feature all the essential technology to keep the water safe and clean. The Pureit Advanced has a distinct look when compared with other water purifiers in the market. The compact form factor allows it to be mounted on a wall, even in tight spaces quite easily. The black and white colour scheme looks attractive and will match with your home decor. The chassis of this water purifier is made using engineering grade ABS plastic material which has been certified safe for usage with edible food products. As we have said earlier, the Pureit Advanced is a compact purifier meant for a small household and office spaces. This water purifier comes with a 5L capacity water storage tank and purifies water at an impressive 12L/hr rate. The filter life of this water purifier is about 8000L, which is significantly more than what its competitor devices offer. The Pureit Advanced employs a two-stage filtration process involving reverse osmosis (RO) and ultrafiltration (UF). Note that this water purifier doesn’t come with a UV filtration, and can disinfect the water if you doubt it is laden with viruses and bacteria. Our advice with this water purifier is that use it only with the water from your well at home and not otherwise. The Pureit Advanced water purifier comes with a one-year warranty which includes on-site repairs. The Pureit Advanced is an affordable water purifier for small households requiring a mild purifier for the water supply from a well. Hindware is a leading sanitary ware brand in India and the Hindware Calisto is the entry level water purifier from the same company targeted mainly for use in homes and office spaces. The Hindware Calisto has a unique and elegant form factor which is easy to mount on walls without much effort. The engineering grade ABS plastic is tough and durable and won’t react with the water and is completely safe for health. The front section of this water purifier features a recessed section to keep the vessels for refilling with water. This prevents spillage of water on to the floor. Also, the front section is magnetically attached to the chassis and can be easily removed for cleaning the interiors. The total capacity of the Hindware Calisto water purifier is 7L and the machines purifier water at a rate of 12L/hr. The filter life of this water purifier is around 6000L, which seems average for the price tag it comes with. The three-stage filtration setup in this water purifier involves reverse osmosis (RO), ultraviolet treatment (UV) and ultrafiltration (UF). These three steps make sure that the water you drink is pure and pristine, and without losing the natural taste. These process also ensures that the dissolved salt contents in the water are kept in check, which prevents the hardness and the resulting bland taste of the water. The three smart LED indicators in the front give information on the power ON/OFF state of the purifier, ongoing purification process and the storage tank full status. The Hindware Calisto comes with a one year warranty. This includes the six month warranty on the filters and the one-year long warranty on the RO membrane. This tabletop/countertop water purifier is your gateway to accessing clean and safe drinking water, no matter how unhealthy the water source is. This concludes our article for the best water purifiers in India under a nominal budget of Rs.15,000. We hope this article did ease your purchase decision a bit, and if you’re not, don’t fret. Do post your queries on models which you like to see reviewed on our site and we assure you we’ll get back to you ASAP. Thanks for your time and have a great day ahead.